Franciscan's Masterpiece China classically elegant pattern, "Carmel", was introduced in 1952 & was discontinued in 1981. 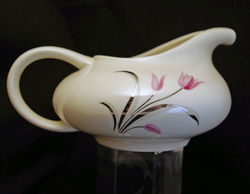 The china is off white with a elegant stenciled tulip of pink and burgundy. The leaves and stems of the tulips are silver/gray, completed with a trim of silver on the edge of each dish. Made in Los Angeles California by Gladding McBean and Co.